Sells all, lower level, ornate, white or green items (Weapons, Armor, Glyphs, Jewelry) in the inventory to the merchant on button click. Since I accidentally sold my soulgems and pots only weapon, armor, glyphs and jewelry are sold. 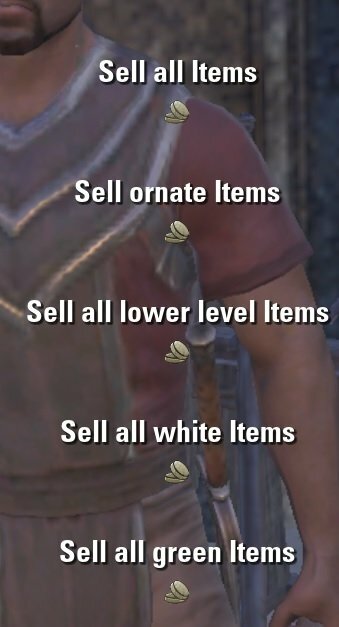 Usefull when grinding as you can simply pick up the green and white items, too and sell them with on click. Does it have checks with FCO Item Saver and Item Saver addons?